Eyes here! All the latest promo deals from PISO FARE 2016 to PISOFARE 2017 launches will be shared with you ASAP. Like Fast! Because you need to know as soon as a promo is announce! We are your ultimate agents of seat sale alerts. We will inform you the latest domestic flights promo, and yes, international ticket sale too! Call us #PisofareAnnouncer, call us your #SeatSaleAlert experts. We are your one stop shop for promo news on Cebu Pacific Air, Air Asia Zest, Cebugo, Philippine Airlines. Also looking for these popular queries like Manila to Boracay? Manila to Batanes Basco? Cebu to Palawan? Davao to Cebu? Manila to Puerto Princesa? Manila to Hong Kong? Cebu to Bangkok? Manila to Tacloban? Manila to Tokyo? If you are, just stay tuned to our website www.PisoFare.com.ph as we bring you the latest and fastest news on express sales. We will also share with you advices and tips like How many handcarry bag can I bring? How to pay AirAsia via DragonPay? How much is excess baggage fee? How much is baggage rate of Cebu Pacific? How can I get promo ticket to Batanes? How to book? Where to Book? So visit our website from time to time so you are always armed with the best booking tips in the land. We are a promo-website, we will not book for you. We also do not accept payments or reservation from our readers. What we do is announce domestic and international promo seat sale of the various airlines here in our country. LIKE and FOLLOW our FB page PisoFares Don’t be left behind! 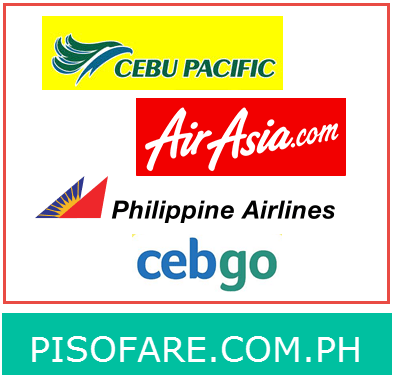 Filed Under: News and Tips Tagged With: Air Asia Promo, Cebgo pisofare, Cebu Pacific Promo Fare, How to Book?, PAL Promo, Piso Fare 2016, Piso Fare 2017, Pisofare Announcer, Pisofares, Seat Sale Alerts, Where to Book? Email me with latest piso fare promo for June 2016. Once there is a low promo fare for Batanes, we will post about it on this website. Please LIKE our FB page to get alerts. Thanks. Piso fare for butuan to manila flight may 28 and manila to butuan on June 1.. Or else Davao to manila , Manila to Davao the same schedule. needPso fare for clark to davao and davao to clark on may 9 to may 13 for 15 person were in group tour pls. paano po magbook? sold out na po ba to? pls. notify me for promos or pisofare for manilato batanes this march-april 2016. I need a sale 2 way ticket to Dubai 🙂 thanks. Do you have flight Manila to Bacolod by tomorrow??? Hi I need a promo fare for 5 adults from Manila to Dumaguete from June 25, 2016 and will be back on June 25, 2016. Thanks. Flight is from June 17, 2016 and will be back on June 25, 2016. Thanks. piso fare manila to ozamis? Pls. notify me promos or pisofare for 7adults and 4children from manila to hongkong. how much is Manila to Tacloban this May 2016 PisoFare? how can I avail the peso fair? where can I get the promo code? notify me about the schedules & prices of the flight for june 2017. Thanks! can you please update me if may pisofare from manila to zamboanga month of December – january roundtrip? rountrip tour manila – busuanga (coron) next year 2017. pls update me. Thanks! When can we avail the piso fare from Japan to Manila then Manila to Japan? Can you please send me message through my email address below. Thanks. Pls. Piso fare manila to dipolog!.. Please send me Po the promo fare manila to Boracay for a round-trip ticket. Magkano Po for two person? Please may I be notified of any piso fare promo local and international. piso fare manila to dumaguete? Meron po bang davao to palawan? magkano po manila to kalibo flight april 7, 2017 and kalibo to manila april 16, 2017? Why can’t I click the links? how to book po?Is this still available? Notify me, upcoming promo MAY 2018 MANILA TACLOBAN round trip.pano po magbook sa online? pls. send an email on how to avail 1 piso fare thank you and good day. Pls notify me of tickets sale for the month of February.